ItemI-57421 - Men with a bear skin. ItemI-57422 - "Yukon Telegraph Trail, Bulkley Valley"; pack train. ItemI-57423 - "Cinching up, Fraser Lake to Hazelton". ItemI-57424 - "On the trail to Hazelton". ItemI-57425 - "Chili-Chula rapids, Fraser River". ItemI-57610 - Wrede Plateau lakes. ItemI-57597 - Pass to Seaton Lake. ItemI-57598 - New Cariboo Road, Fraser Gorge near North Bend. 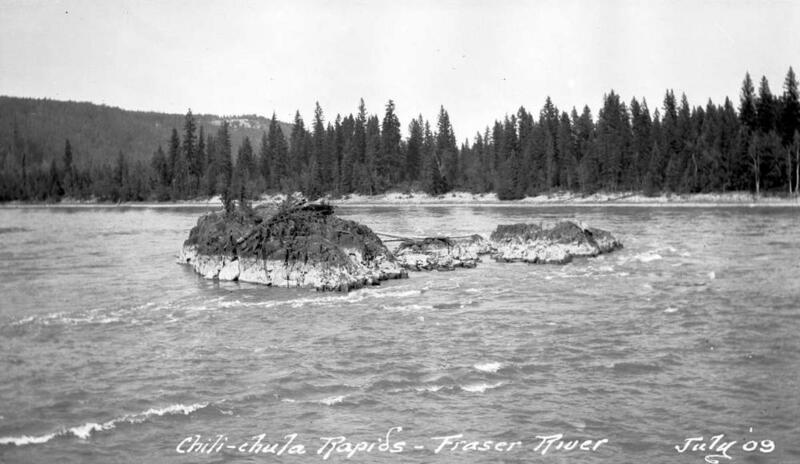 Item I-57425 - "Chili-Chula rapids, Fraser River".